April in our huge family is a busy month, birthdays and birthdays and birthdays and an anniversary. Imagine my sister turning 50. Its funny how you think that all those who are younger to you are probably not getting older. I just spoke to my niece and its her birthday soon, and I thought she was just 22. Same way as I can’t believe my sister is turning 50. I know she has grown up kids and all, but difficult to imagine that she is 50. However, these days age is just a number for a lot if us till our body starts aching and we need to hobble out of the bed in the mornings because of stiff bones. Memory is another give away when you just can’t remember names. Yesterday I gave a lift to my friend and she asked me which make my little car is. Can you imagine I just couldn’t remember… I go “its a Toyota”. “Yes but which one”, she asked and the name just wouldn’t come. After I dropped her home and reached my gate, I suddenly remembered its a Toyota Passo! I do crosswords, sudoku and word puzzle everyday. However the memory still fails me when it comes to remembering names.Oh well will have to challenge my brains a bit more.So little sister Happy Birthday. Have a great birthday. Always wish you happiness, good health and lots of fun filled moments. For the month of April I was paired with Amrita Iyer of The Food Samaritan, for the Shhh cooking secretly group. She challenged me with cook with all purpose flour and summer fruits. Amrita thank you for the wonderful ingredients. With these ingredients in mind, the fruit tartlets came to my mind as I had wanted to make those in a long time. For us in Kenya, summer fruits means things like papaya, pineapples, mangoes, watermelon etc. All tropical fruits. I used mango, pineapple and grapes. 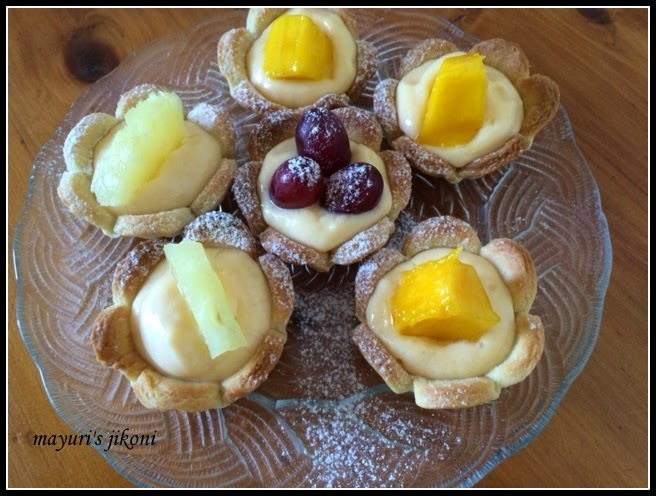 Fruit tartlets make cute little desserts or even can be served at tea time. Kids will love the little tarts too. I hardly ever work with shortcrust pastry, as I find the weather here just too hot for it. However, I am glad i baked these little treats. I filled just a few and have stored the other shells in an airtight container for future use. The shells or tartlets can be prepared a couple of days ahead if you are baking them for a party. Filling them is easy just before the guests arrive is easy, as long as the filling too is ready. Do you find it difficult to believe that people family members younger than you are getting older? Sift flour and sugar together into a bowl. Add salt if you are using any. Cut the butter into small cubes or grate it and add to the flour mixture. Using your finger tips, rub the butter into the flour till it resembles breadcrumbs.Or you can process it in your food processor. Add milk and form a dough. Do not knead too much. Just bring the dough together. Let the dough rest wrapped in a cling film for 5 minutes in the fridge. Using cling film or plastic sheets roll out the dough into a circle with a ¼” thickness. Use a cookie cutter which should be bigger than the diameter of the muffin or tart cups. Cut the dough with the cookie cutter. Place the cut shapes in the cups. Gather up the remaining dough and roll again. Cut into shapes and line the cups. Place the tartlets in the freezer for 30 minutes. Cut small squares from the aluminium foil. Press the aluminium foil gently into the frozen pastry. Put the tartlets into the oven to bake for 10 minutes. After 10 minutes, remove the aluminium pieces from the tartlets and put them back in the oven to bake for further 3-4 minutes. Remove the tartlets from the oven. After 3-4 minutes gently remove the tartlets from the cups gently and let them cool on a wire rack. Store the tartlets in an airtight container till required. If you are using metal tartlet or muffin moulds, you need to grease it with butter before lining it with the pastry. I used silicone moulds which do not need any greasing. Take a ¼ cup of milk from the measured milk. Add custard powder to it and mix well. Put the remaining milk and sugar in a pan. Heat it up till it becomes hot. Stirring the milk, add the custard milk mixture. Mix till the mixture becomes thick. Remove the custard from the heat. Add the lemon zest and mix well. Let the custard cool down. Remember to stir it frequently so that a thick skin does not form on top. Leave the custard in the fridge to cool till required. Wash and pat dry with a kitchen towel, the fruits you are going to use. If need be peel, cube etc the fruit. Fill the tartlets with the custard. Dust with a bit of icing sugar and serve. Do not knead the dough too much otherwise it will make the pastry tough. Its important to freeze the tartlets before baking because if you don’t the pastry will shrink on baking. I used a cookie cutter to line the muffin cups. You can also roll out smaller circles and line the muffin or tart moulds. I find using aluminium foil pieces so much easier than rice or beans. I find beans sometimes get stuck to the dough on baking. Use what suits you best. I did find my tartlets a bit thick so maybe I will roll it a wee bit thinner. However the thickness prevented them from getting soggy. I find rolling the dough between two sheets of cling film or plastic so much easier than using flour to roll. Using flour makes the dough tough. When you remove the aluminium foil and put the tartlets to bake again, keep an eye that they don’t become too brown. Maybe I should have removed mine after 3 minutes. You can use any filling of your choice… lemon curd, fresh whipped cream,cream cheese, jelly etc. If the custard becomes chunky, just whisk it for a few seconds with a hand blender to make it into a smooth consistency. Can add about 2 tbsp desiccated coconut to the flour mixture. If you want to glaze the fruit then mix ¼ cup sugar, ½ cup fruit juice and 1 tbsp cornflour. Heat the mixture stirring it till it thickens. Simmer for 2 minutes over low heat. Cool the mixture and then use it to glaze the fruit. Very tempitng n delicious tarts…love d all images. They are so cute! They look really easy to make too. Flower shaped tartlets are looking so cute. These tartlets look so cute.. and fruits in desserts is always a great idea. Thanks Dannii, they are pretty easy to make. Thanks Shweta. You can treat your friends to a refreshing different dessert and you get lovely berries there.